Every parent in America has probably used this phrase many times: “Breakfast is the most important meal of the day.” If you recognize the multiple benefits of breakfast for strong bodies and smart brains, that’s great. If you make certain that your children never leave home without a breakfast of whole grains, fresh fruit and Greek yogurt or backyard eggs, that’s awesome for your kids. Their metabolism got a great kick-start and their brains have the fuel they need to focus on the teacher and learn new information – until lunchtime – every day. But what about Jane, Johnny, Sam, Suzy and all the other students sitting around your child’s desk or table at school? Did they have a balanced breakfast? Did they have breakfast at all? In fact, did they have anything nutritious since they ate lunch at school the day before? Why should you care what your child’s classmates have or have not eaten? 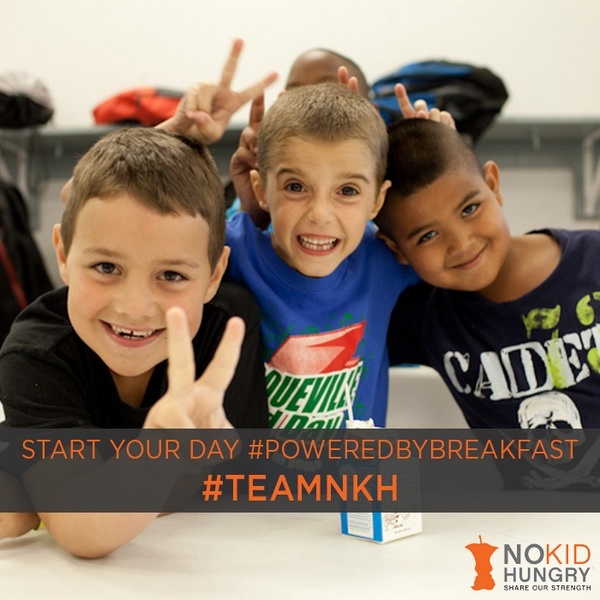 Why should you support a breakfast program at your school even if your kids will never need it? Too many children are too hungry to learn. 87 percent of principals see hungry children in their schools at least once a week and 73 percent of teachers have students who regularly come to school hungry because there isn’t enough food at home. Even if your family is blessed with a perfect breakfast every day, other inattentive, unfocused, under-nourished children can affect your child’s ability to succeed at school. It happens directly when hungry children need more of the teacher’s time -and indirectly when your child is distracted from the lessons at hand. The important connection between breakfast and school performance is well known. When standardized tests are given, every school in America tells students to “get a good night’s sleep and eat good breakfast.” Unfortunately, breakfast during test week is too little too late! Children need breakfast every day to get new information and skills into their brains, not just to get them out on test day. Digest the facts about breakfast and hungry children in America. The 2013 and 2012 Teacher Reports are good places to start. You may also want to Map the Meal Gap in your state or county. A 2013 USDA report estimated that 1 in 5 American children (21.6 percent) live in food insecure homes. In my opinion, it is a moral imperative that we change this fact. Even if you do not agree, think of all the educational problems that hunger causes in classrooms from coast to coast. five leading education organizations and the Food Research and Action Center (FRAC) announced the Breakfast for Learning Education Alliance to encourage schools and states to increase school breakfast participation. The alliance includes the major national associations representing parents (PTA) and virtually everyone who works in schools – teachers, principals and administrators. Honestly, can all these groups be wrong about such a simple and effective program. 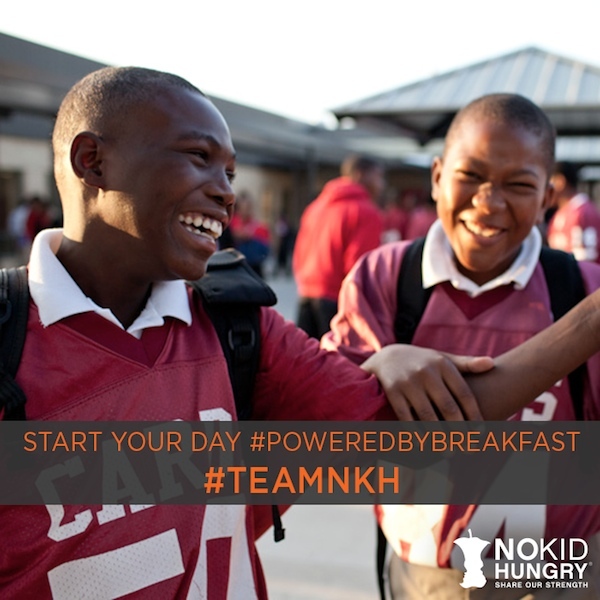 Advocate for breakfast in your community. Students from every income level benefit from a balanced morning meal every day, whether they eat it at home or school. Fuel Up to Play 60, a national program to improve school nutrition and fitness, has made healthy breakfast choices and effective school breakfast programs a priority. Check out their breakfast “plays” and you’ll find fun ways to get all students more excited about getting a smart start on every day. While your child may not need a school breakfast program, their friends and classmates may not have that luxury for a myriad of reasons. 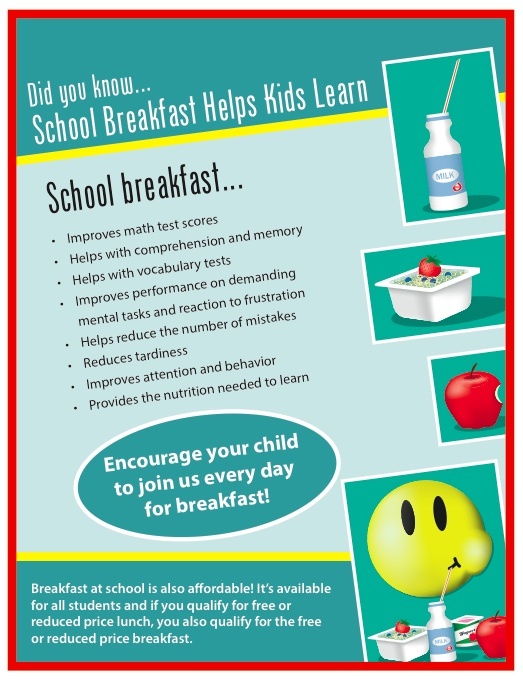 Breakfast is a simple, cost-effective way for high-performing schools to help every child be well nourished and ready to learn. That’s a strategy that I support as a mom, a Registered Dietitian (RD) and a taxpayer. March is National Nutrition Month – and a great time to make sure your family is powered by breakfast. My takes on better breakfast bites can be found at Make Time for Breakfast and 4 Tips for Better Breakfasts from Kids Eat Right and the Academy for Nutrition and Dietetics. I’ve had the pleasure of participating in several Michigan healthy school events over the years and I am honored to be invited back in March (23-27) to present a series of four “First Fuel” School Breakfast Challenge trainings across the state. The Michigan goal is to have 60 percent or more of free/reduced lunch participants also eating a school breakfast by 2015. The recently released Food Research and Action Center’s (FRAC) 2014 School Breakfast Scorecard found reported that Michigan’s rate of school breakfast participation is 53 percent of lunch participation – an increase of 2 percent since 2010. While the Michigan school breakfast goal is ambitious, they have strong support and the right partners for the job. At the Michigan Department of Education, support comes from the very top, since Superintendent Mike Flanagan is a strong and vocal advocate for school breakfast as the foundation for academic success. I know several other states that wish they had such a knowledgable and supportive state superintendent! Other active partners in the “First Fuel” School Breakfast Challenge include the Michigan Team Nutrition Program, which has a extensive reach on Twitter and Facebook, as well as Michigan Blue Cross Blue Shield and United Dairy Industries of Michigan who are offering $250,000 in grants for marketing and equipment. I am looking forward to being part of the Michigan work to insure that all children are well-nourished and ready to learn. As they say in real estate, it’s all about location, location, location. Many educators and school administrators are asking if a classroom is the right location for a school breakfast. The answer from superintendents, principals, teachers and students across the country is a resounding YES. From reading the research, visiting the schools and talking with stakeholders, these are the top four reasons that I’m a big believer in – and booster for – breakfast in the classroom (BIC), sometimes called breakfast after the bell. 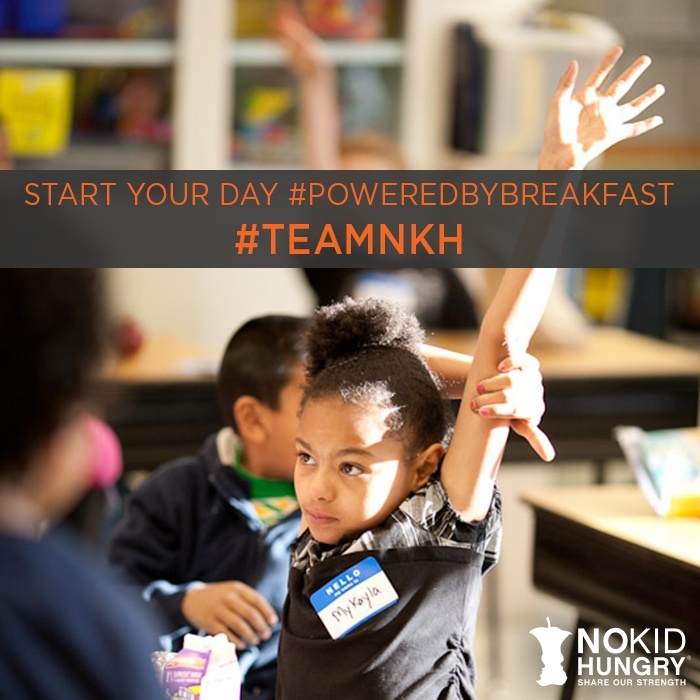 Serving breakfast in the classroom is a proven strategy for increasing breakfast participation. The Food Research and Action Center’s (FRAC) 2014 School Breakfast Scorecard credits increased numbers of low-income students eating breakfast to strategies like moving it out of the cafeteria into the classroom. Students like the comfortable atmosphere of their classroom better than a loud cafeteria. 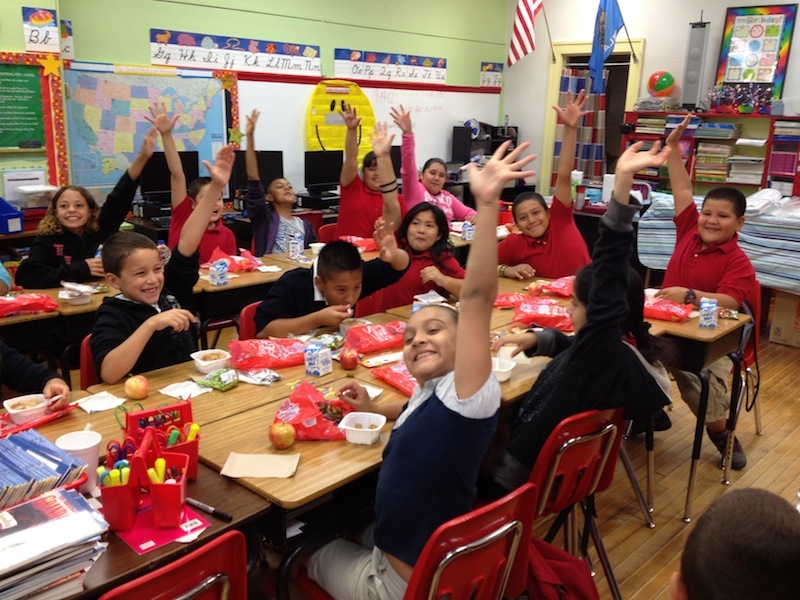 Eating in a classroom – with an opt-out option – reduces the stigma of breakfast-for-poor-kids-only. When I talk to students, like those in the photo below, they tell me they like to eat with their friends in a quiet, calm place. 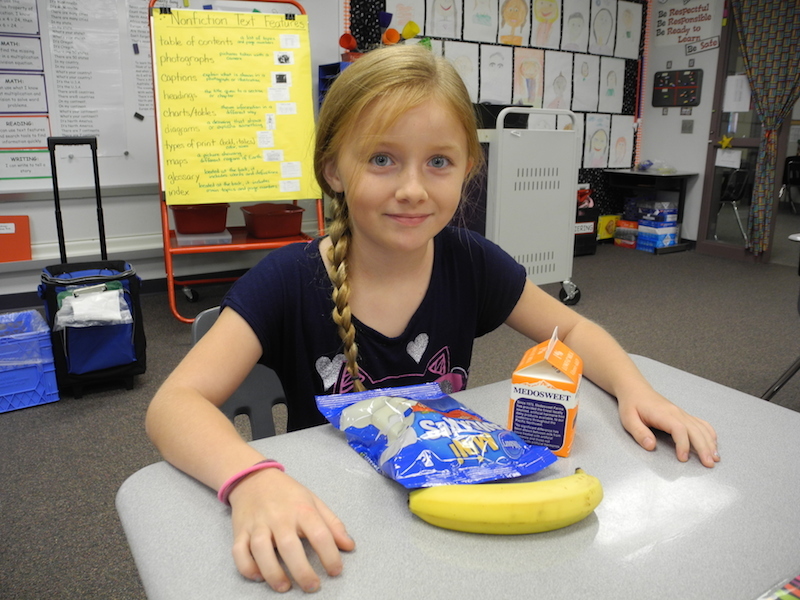 Teachers see positive results when students eat a morning meal in the classroom. The 2013 Too Hungry to Learn report showed that 75% of teachers liked knowing that their students are energized and ready to learn. Seventy-six percent use the time to take attendance, 65% make classroom announcements. 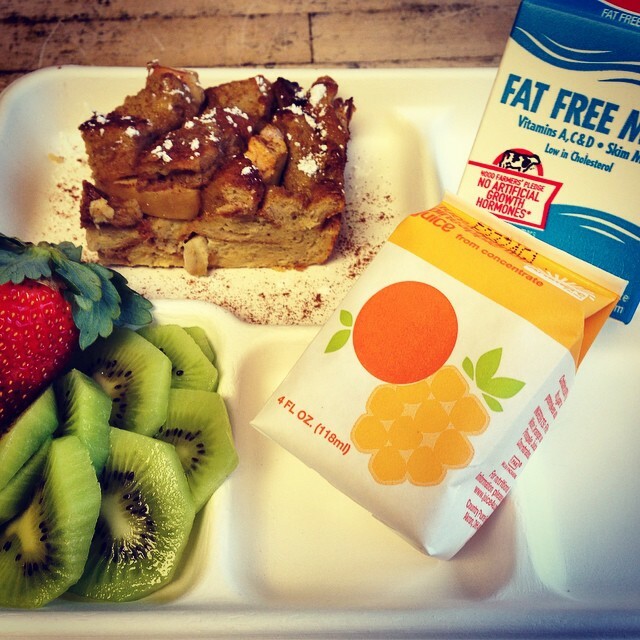 School administrators have also embraced the benefits of serving breakfast in the classroom. In 2013, the American Association of School Administrators (AASA, The Superintendents Association) published an issue of their magazine on Improving Attendance, Health and Behavior: Moving Breakfast Out of the Cafeteria. Breakfast in the classroom is good for students, educators and administrators. I call that a win-win-win – and clearly this classroom does too.